Most owners can fill in the blank with time, money, resources, or other obstacles that make it difficult to implement the best possible solution (or set of solutions) for their infrastructure projects. As a result, they are often limited to addressing today’s needs based on the cheaper-faster response at the expense of the better or best solution. Additionally, pressing needs and political forces often compel owners to make “today” project investment decisions while sacrificing the long-term or programmatic investment that is best for utility ratepayers. That’s where flexibility comes in. Adding more flexibility to how projects are evaluated, planned, designed, and ultimately delivered can help fill the gap between available and needed resources. Because every project has different drivers, stakeholder interests, and project conditions, rigidly adhering to a single approach for program or project delivery limits both the effectiveness of a solution and the value of the solution for ratepayers. So how does a water utility, especially one that traditionally has favored convention (i.e., design-bid-build, or DBB), become more flexible? Adding more flexibility to how projects are evaluated, planned, designed, and ultimately delivered can help fill the gap between available and needed resources. The American Heart Association recommends four types of exercise: balance, strength, endurance, and flexibility. Municipal and utility agencies that are generally strong, enduring, and balanced can become stiff from doing the same things the same way for so long and can benefit from increased flexibility. With exercise, a single attempted downward-facing dog pose or an occasional toe touch doesn’t increase flexibility; becoming more flexible requires intentional stretching and consistent practice. Applying this principle to our industry, water agencies have an opportunity to become more flexible through collaborative delivery models. Delivery models founded on collaboration allow owners to make best-value solution decisions through increased flexibility and improved information. These models offer varying degrees of flexibility and carry associated benefits as well as challenges. But in each case, flexibility is provided through collaborative behavior. Flexibility increases an owner’s ability to attain goals with limited resources, and the more-collaborative delivery models offer the most flexibility. Delivery approaches that offer substantial collaborative advantages and maximum flexibility include construction management at risk, fixed-price designbuild, and progressive design-build delivery models. The relative advantages, disadvantages, and flexibility summary table provides an owner-perspective comparison of overall flexibility — and several criteria that contribute to owner flexibility — between each featured model and the conventional design-bid-build (DBB) model, indicating where advantages (+), disadvantages (-) and no significant differences (0) exist. Currently, all but seven states provide enabling legislation for CMAR, which is also referred to as construction manager/ general contractor (CM/GC) in some states. The Water Design-Build Council (WDBC) describes CMAR as a collaborative project-delivery method in which the owner contracts separately with an engineering firm to design the project and a CMAR firm to act as a construction manager/ general contractor. Choosing CMAR delivery enables an owner to select a CMAR firm based primarily on qualifications. With CMAR, the qualifications-based selection (QBS) may or may not include a pricing element for preconstruction services. The engineering firm is typically selected in the same manner as with DBB. A key feature of CMAR is that owners benefit from the pricing, schedule, constructability, and other considerations by engaging the CMAR contractor as a project partner and stakeholder. Although the engineer is responsible for design and the CMAR contractor is responsible for construction as with DBB, the CMAR provides guidance and feedback during the early design phase of the project. This can improve the accuracy of assessments — including risk, pricing, and schedule — that may ultimately impact the overall success of the project. Additionally, the procurement period is shorter, and CMAR preconstruction-phase services occur concurrently with design, giving the owner more schedule flexibility. The CMAR team’s deliverables during the preconstruction phase of the project include early cost models (ECMs) to keep the design and schedule in check during early design phases (approximately 30 to 50 percent), followed by a guaranteed maximum price (GMP) at a fixed point and time (usually around 60 to 70 percent design). If ECMs predict a design that is over budget based on current construction-market pricing, the owner has an early opportunity to reconsider design elements if budget is a key driver. Collaboration plays an important role in this process to identify ways to reduce risk and scope or to accept a shift in the overall project budget. Owners also have the opportunity to take an exit ramp if the GMP is over budget and can move forward with the project using a different delivery model. While the owner is still contractually the project integrator, early engagement of the CMAR contractor limits the owner’s exposure to claims related to the Spearin Doctrine. In general, this model gives owners more flexibility because they can use improved information to weigh the impacts of design decisions earlier in the project. This results in higher certainty of both cost and schedule. Owners are also able to more accurately weigh the impacts of risks by engaging the CMAR partner early. The WDBC describes FPDB as a collaborative delivery model where the owner retains a single contract for the design and construction of a project for a fixed price. The owner typically selects the design-builder through a best-value selection process, weighing and scoring qualifications, technical approach, and capital costs based on the prioritization of factors the owner deems most valuable. A key feature of the FPDB approach is that owners are able to limit their exposure to design/construction risks by managing a single contract for both services. The design-builder, rather than the owner, is responsible for the integration of design and construction. Because the fixed price for the project is established at the completion of procurement (approximately 30 percent design), the project schedule benefits as a result of the reduced design/procurement period. Additionally, the design-builder can fast-track certain elements of the project through early works packages prior to completion of final design, and the owner can be certain of costs much earlier in the design process. Despite potential issues associated with FPDB (e.g., the owner’s loss of control over the final design), this delivery model gives the owner more flexibility through the procurement period and during final negotiation of the fixedprice contract. However, upon acceptance of the fixed price and the terms of the qualified proposal, owner flexibility is limited except through change-order provisions of the contract. Flexibility increases an owner’s ability to attain goals with limited resources, and the more-collaborative delivery models offer the most flexibility. The WDBC describes progressive design-build delivery as a two-phase delivery method in which the project’s design, cost estimating, construction schedule, and final GMP or fixed price are developed during phase one. If the owner and designbuilder agree on the schedule and the GMP, the final design, construction, and commissioning are completed during the second phase. Progressive design-build delivery is similar to CMAR in many respects, but several differences merit mention. In particular, the owner is able to shift the integration between design and construction to the design-builder as with FPDB. This is one of the key areas of risk that create claims/change order challenges in DBB delivery but can be avoided through PDB (and FPDB) delivery. An important benefit of PDB is that owners are able to maintain full control of the design during the phase-one preconstruction services, with a better understanding of the implications of their design decisions. Similar to CMAR, this allows the owner to make the most informed decisions through collaboration with the PDB and other project stakeholders. Similar to FPDB, owners gain schedule advantages by allowing the design-builder to fast-track certain elements of the project through early works packages prior to completion of the final design and finalization of the GMP. This may include early procurement of long-lead equipment items and may help limit price escalation for some commodity materials. As most water professionals understand, the decisions that have the most beneficial impact on the lifecycle cost and overall schedule of any project are made at the early design phase. Owner benefits are dramatically increased when collaboration includes more than just the owner and engineer during early design decisions. 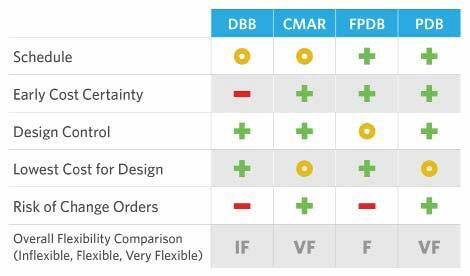 Compared to both CMAR and FPDB, PDB offers the most flexibility because the owner benefits from a more collaborative environment during the earliest phases of design, when the most impactful decisions are made. This benefit extends beyond just the technical aspects of the project. Owners are also able to limit commercial and legal risks that are inherent in more conventional delivery models, while collaborating with their design-build partner to understand and manage those risks. The partners jointly define and assign risks as a team. In Virginia, PDB not only helped two water authorities meet a tight schedule for expansion of new, jointly owned water facilities, including an intake and a larger treatment plant; it also provided the flexibility to foster and apply an innovative solution and even respond to a new project driver midstream. 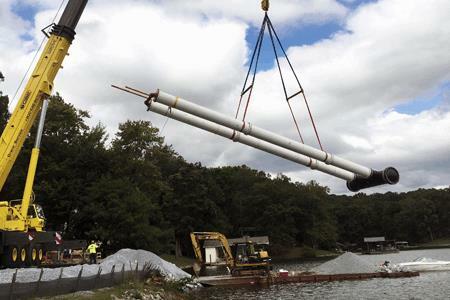 In this example, PDB allowed the Bedford Regional Water Authority and the Western Virginia Water Authority to proceed with a necessary project despite initial uncertainty regarding project costs and to respond nimbly to unanticipated design challenges. The owners chose PDB as the delivery approach to gain flexibility during both design and construction. When the project team reviewed water intake design concepts with the local homeowners’ association, the residents expressed concern about the extensive construction, so the project team adopted a least-impact approach as an important new project driver. The innovative new approach included angled turbine pumps, which greatly reduced the need for excavation and eliminated the need for shoring. 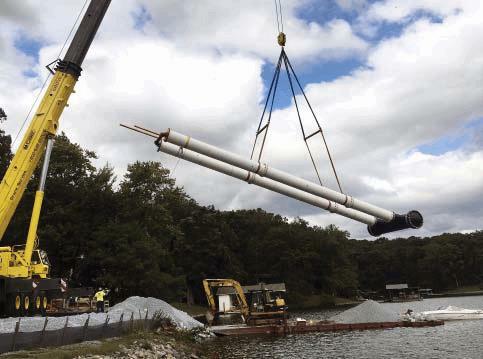 The homeowners were happy, and the onshore building required to house the associated electrical and control components was significantly smaller than would have been required for the originally planned pumping station. Construction of the fast-tracked project was completed to allow water production to begin in May 2017. To return to an exercise analogy, consider the duration of a race. Sprinting or running a 5K race may not require significant flexibility, but participants in a 10K, half-marathon, or full-marathon event generally must gain flexibility in order to avoid injury; participants who lack flexibility tend to pay the price after the race. Increased flexibility makes the race less painful and results in a better overall experience. Owners who carefully consider the type of race they’re running, specific project drivers and goals, and critical success factors to determine how much flexibility they’ll need and which delivery approach offers that level of flexibility can optimize not only the price, but also the experience. David E. Kinchen, DBIA, is an associate vice president and regional director for Black & Veatch, responsible for collaborative project delivery (design-build, construction management-at-risk, and public-private partnerships) projects in North America for Black & Veatch’s water business. He also serves on the board of directors as a previous president of the Water Design-Build Council, is an active member of the Design-Build Institute of America (DBIA) water/ wastewater committee, and is the current president of the DFW Chapter of the DBIA Southwest Region. Kinchen has more than 30 years of experience and holds DBIA professional certification. A. Blake Childress is a Black & Veatch senior vice president and the managing director of the Americas Design-Build group in the water business, responsible for collaborative project delivery throughout North America. He has more than 40 years in the water industry, with the last 20 years focused on design-build delivery.